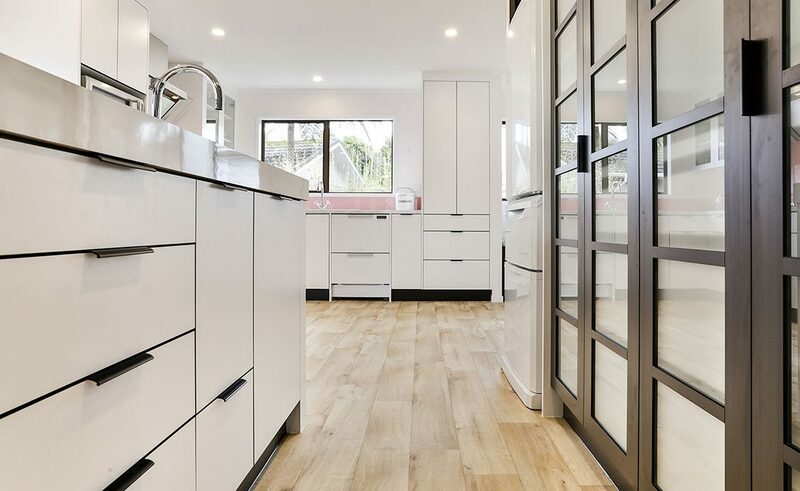 This stunning new kitchen in Whangarei is proof that having a tight budget doesn’t necessarily mean a compromise on style or the quality of finish. 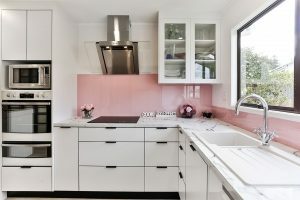 Frustrated and uninspired with her small, closed off kitchen, Carol Field turned to designer Jillian Kake from Mastercraft Kitchens Whangarei to help her inject some new life into an area of the home she and her husband, Rick, like to spend time in together. 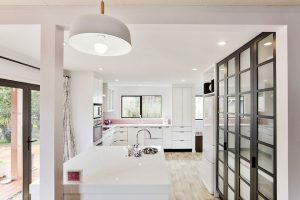 The finished kitchen is, in fact, a combination of three rooms – the original kitchen, the dining room, and a small laundry. 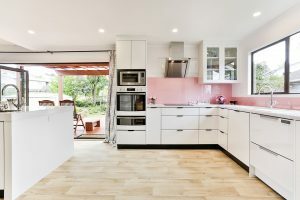 Also, as part of the renovation, a large bi-fold door was added that opens the new space to a covered entertaining deck. 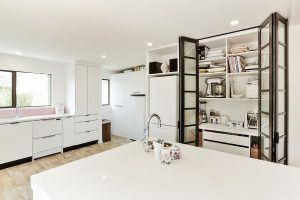 One of Carol’s primary requests was for lots of bench space and storage, and a separate area she could bake on, with storage close by for all of her appliances. 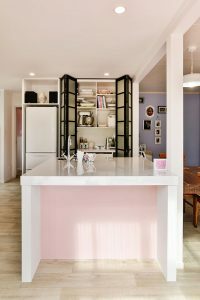 She also wanted the design to have a slight Oriental influence. 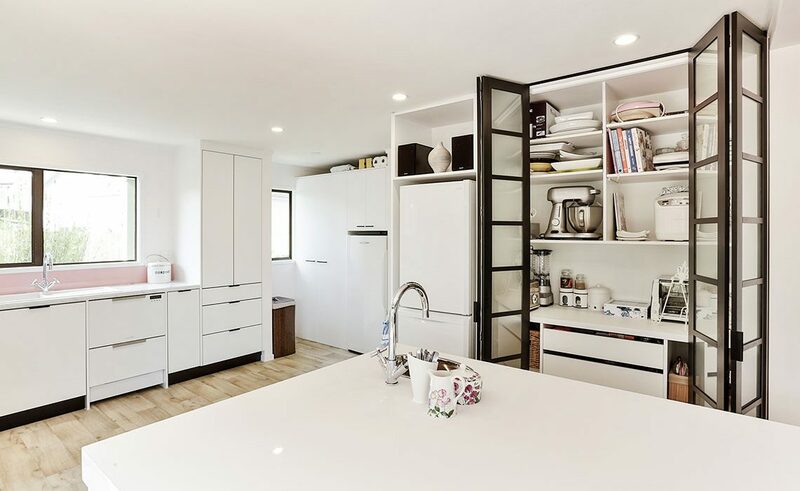 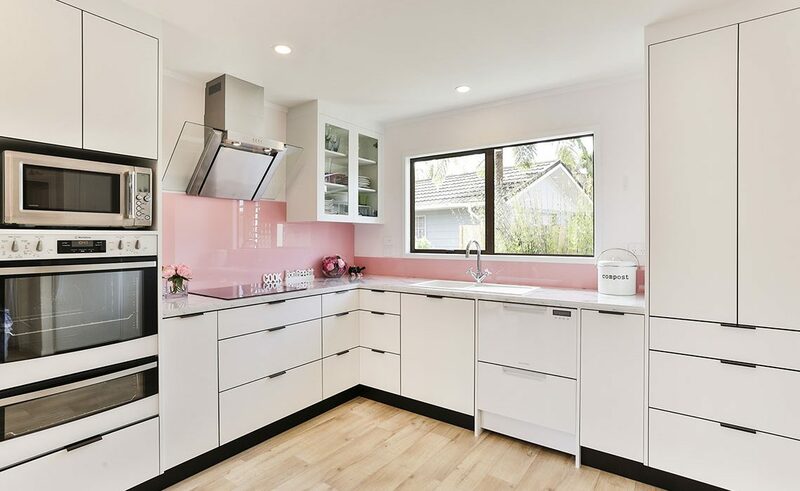 To satisfy these requests the designer introduced a full-height storage cabinet adjacent to a large island that was specifically designed to accommodate Carol’s baking equipment. 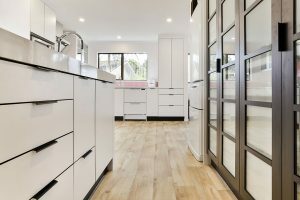 She then designed cabinetry doors that mimicked a Japanese-style shoji screen. 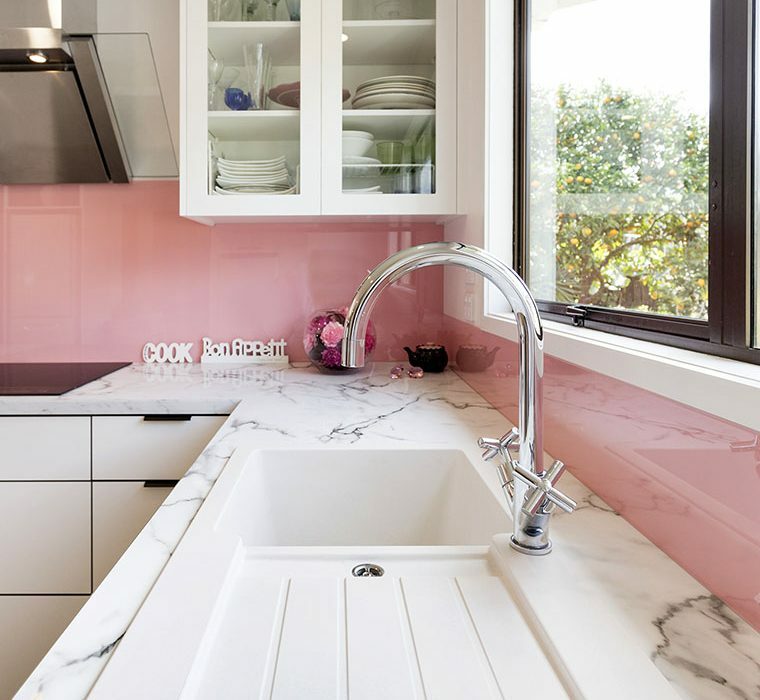 Jillian says she used cost-effective products worked in clever ways to make them look good. 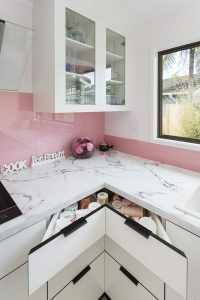 For instance, using black PVC strips around the end edges of the cupboard and drawer fronts to create a shadow line, then using black, top-mounted handles to finish the look, created the black negative detail around the cabinetry. 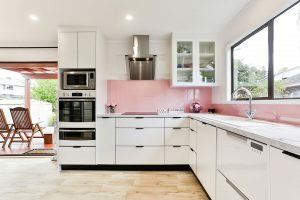 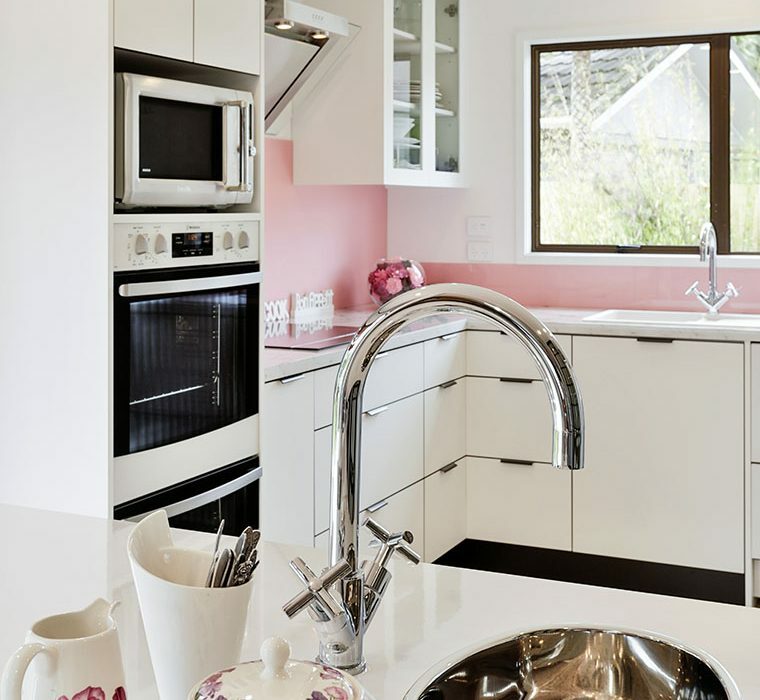 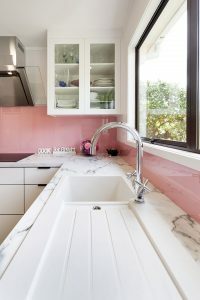 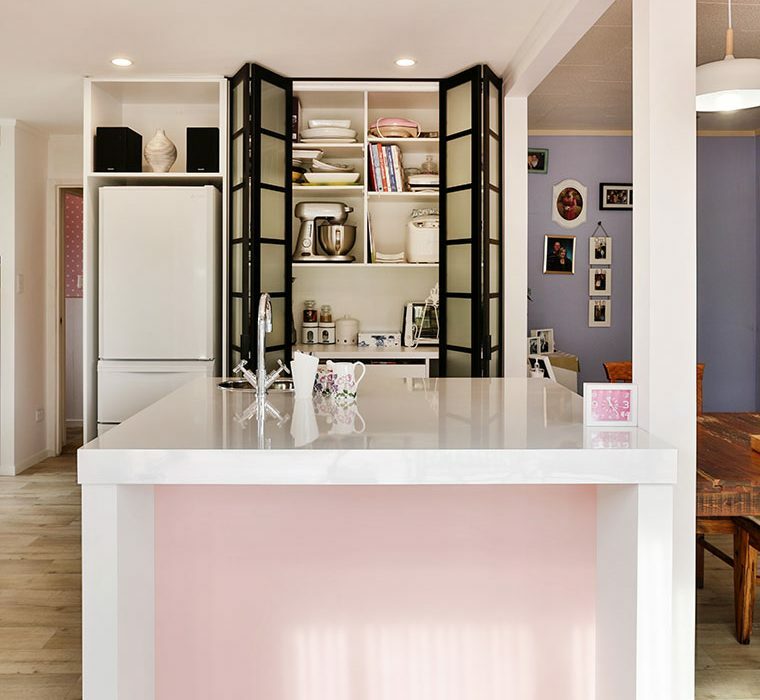 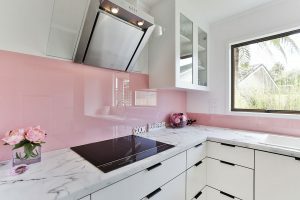 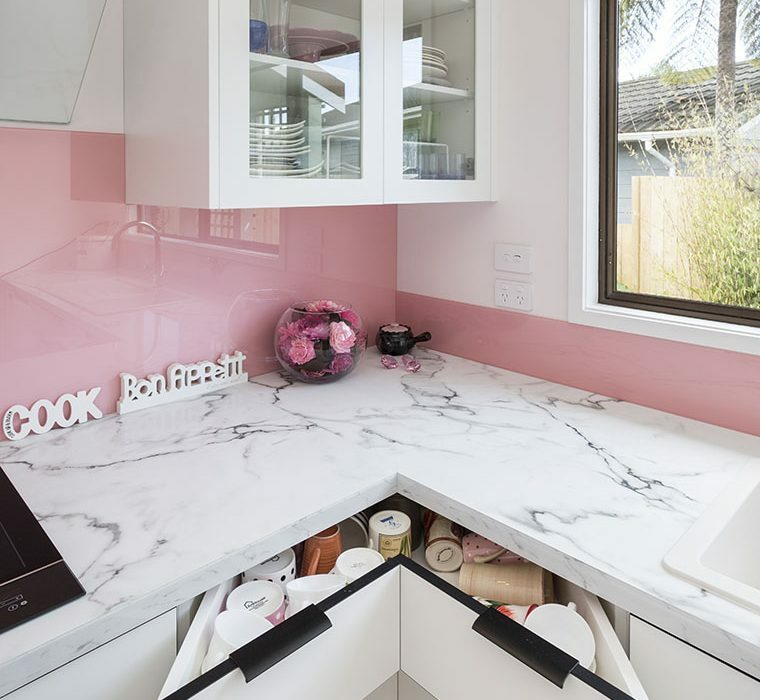 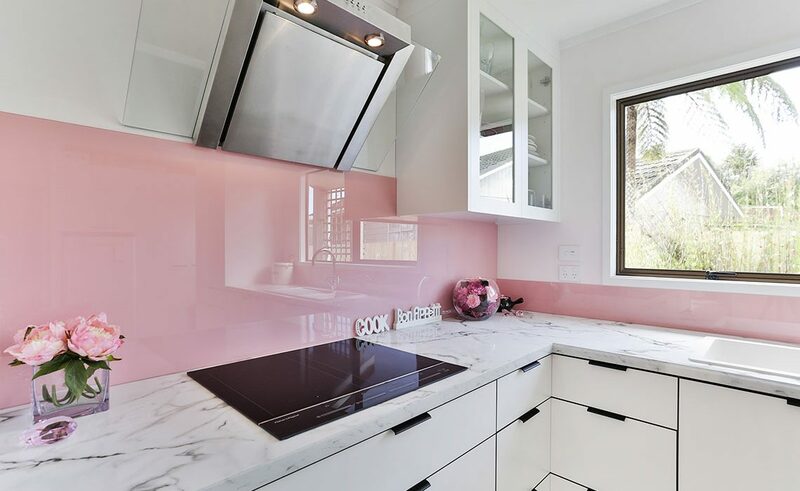 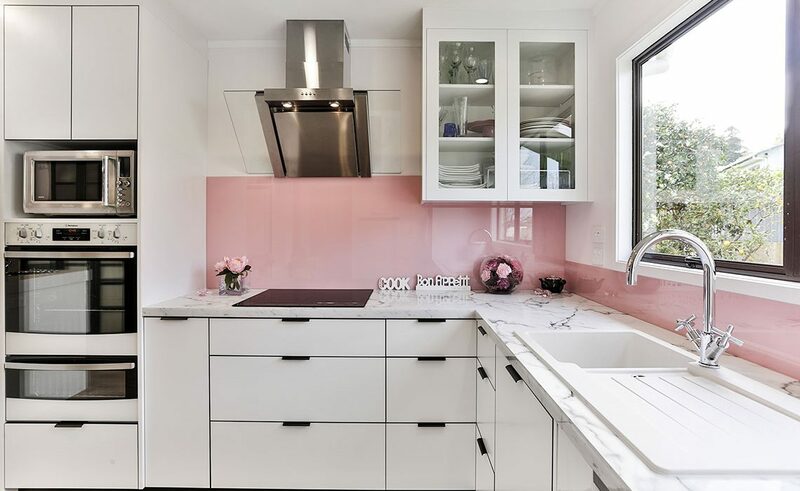 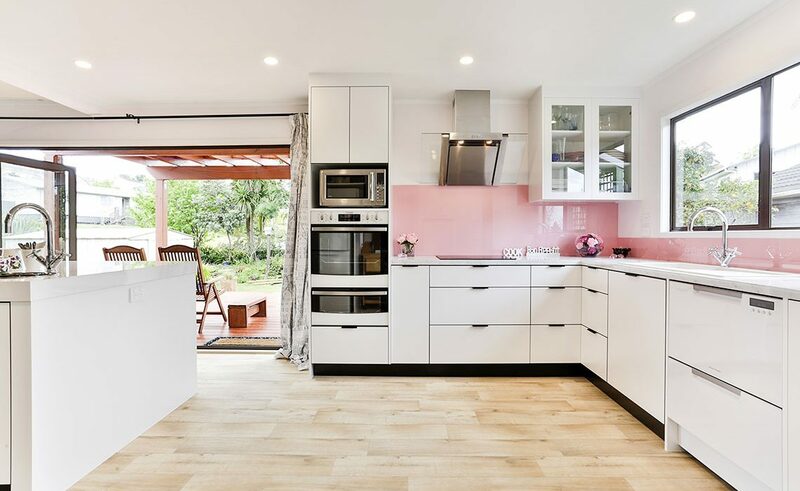 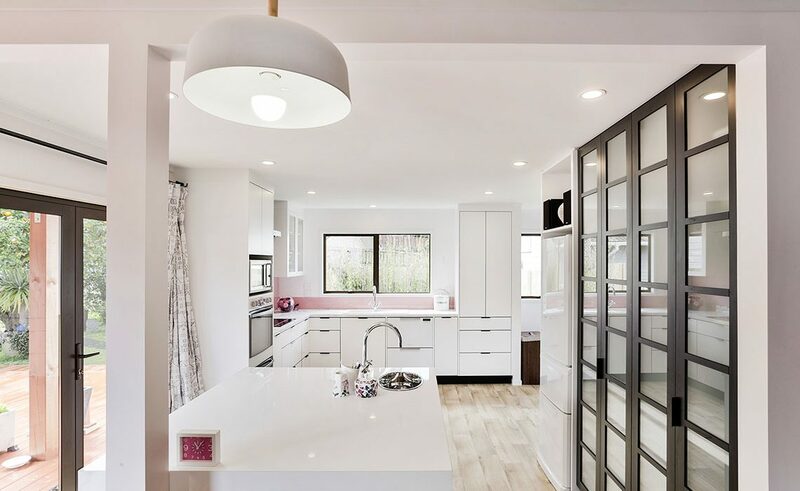 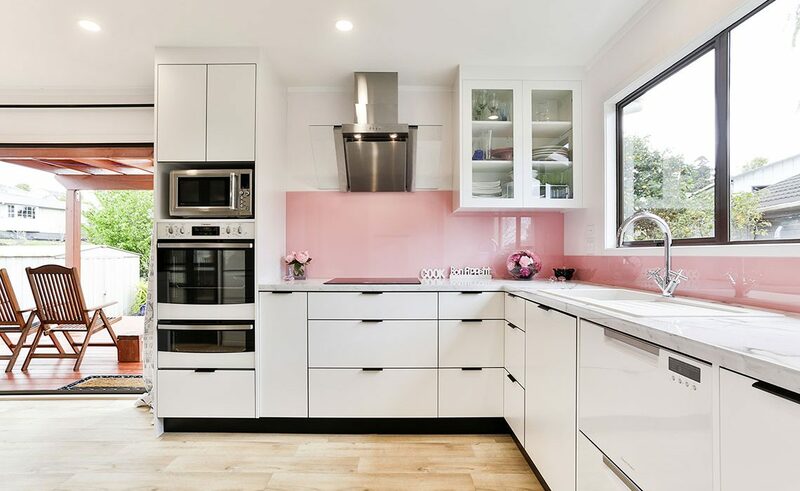 To finish off the kitchen, white appliances were specified, because they suited the clean look of the rest of the kitchen – even the sink is white, so as not to distract the soft pink colour of the splashback. 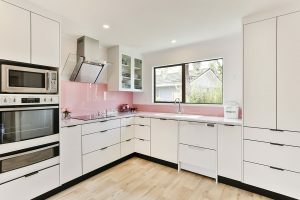 It’s a sentiment echoed by Carol and Rick, who say that walking into their new kitchen is like coming into a brand-new house. 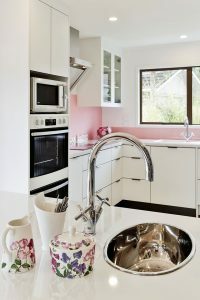 This kitchen was designed, manufactured and installed locally by Mastercraft Kitchens Whangarei.